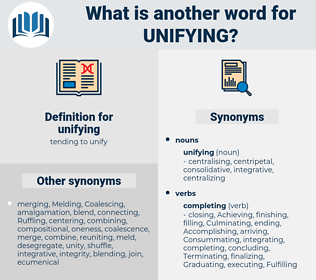 What is another word for unifying? 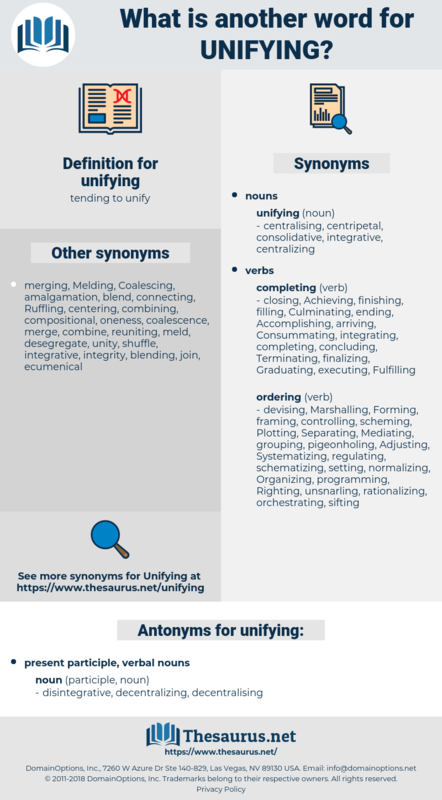 unitary, unified, standardized, Harmonizing, reunified, overarching, unanimous, joined-up, common, combining, binding, coherent. Consolidating, uniformizing, standardising, reconciling, synthesizing, summarizing, summarising, converging, Embodying, Promoting, reflecting, joining, Linking, collecting, gathering, Extending, Bridging, rallying, Amassing, pulling, showing, drawing, Harmonizing, combining. reunite, standardise, combine, integrate, reconcile, amalgamate, streamline, merge, centralize, bring. Everywhere the new unifying impulse undermined or swept away local Parliaments or provincial Estates. Probably the most unifying physical characteristic of all of the specimens is the nature of the skin on the anterior part of the flank.